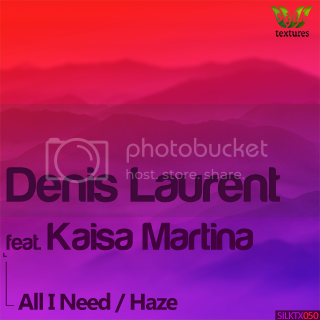 Instrumentalist Denis Laurent & vocalist Kaisa Martina have teamed up on "All I Need", their 2nd Silk Textures offering. This promising Ukrainian duo has a wonderful talent for "romantic" deep and progressive house, as demonstrated by their previous "My Feelings For You" single. Their latest begins with a deep, sensual groove, while various "late-night" atmospheric effects capture the "out-of-body" bliss of a couple first falling in love. Kaisa's effortlessly beautiful and heartfelt lyrics profoundly deepen the mood. Denis Laurent's solo offering "Haze" serves as the B-side; it's a much deeper affair, centered on a subterranean bassline. Gentle pads give the song a free-flowing, contemplative feel, while light melodic synth strokes gracefully usher the listener along.